Medicinal Plants Processing Research Center, Shiraz University of Medical Sciences, Shiraz, IRAN. Department of Toxicology and Pharmacology, School of Pharmacy, Shiraz University of Medical Sciences, Shiraz, IRAN. Anthocyanins are famous members of flavonoid group with multifaceted effect including anti-inflammatory, anti-oedema activities, antioxidant and antitumor activity. Berberis integerrima is candidate in treatment of gastrointestinal diseases, bleeding, fever, malaria and hepatitis. The aim of this study is to isolate anthocyanin of Berberis integerrima Bunge fruits (AFBI) and measurement of free-radical-scavenging activities by different methods. AFBI isolated by column chromatography. Anthocyanin content was measured by PH-differential method and antioxidant activities of AFBI quantified by various methods (DPPH, FRAP, ABTS) as well as lipid peroxidation. Anthocyanin content is 14.36 ± 0.33 mg/g before purification by column and 34.51 ± 0.42 mg/g in AFBI. IC50 of anthocyanin fraction before loading on column are 471.06 ± 1.8 μg/ml, 65.98 ± 0.66 μg/ml and 495.5 ± 1 μg/ml for DPPH, FRAP and ABTS assay, respectively. These IC50 after loading on column are 66 ± 0.04 μg/ml, 11 ± 0.16 and 60 ± 2.1 μg/ml for DPPH, FRAP and ABTS assay, respectively. Nitric oxide scavenging values are 53 ± 0.5% and 97.04 ± 0.69% before and after using column for anthocyanin purification. The percentages of lipid peroxidation inhibition of AFBI are about 39% in first day and 95% after 10 days. According to results, mentioned method is efficient for anthocyanin purification and antioxidant activity increased significantly after loading sample on this column. Berberis integerrima fruits can be noticed as proper source of anthocyanin which able to scavenge different free radicals and protective agent against lipid peroxidation. 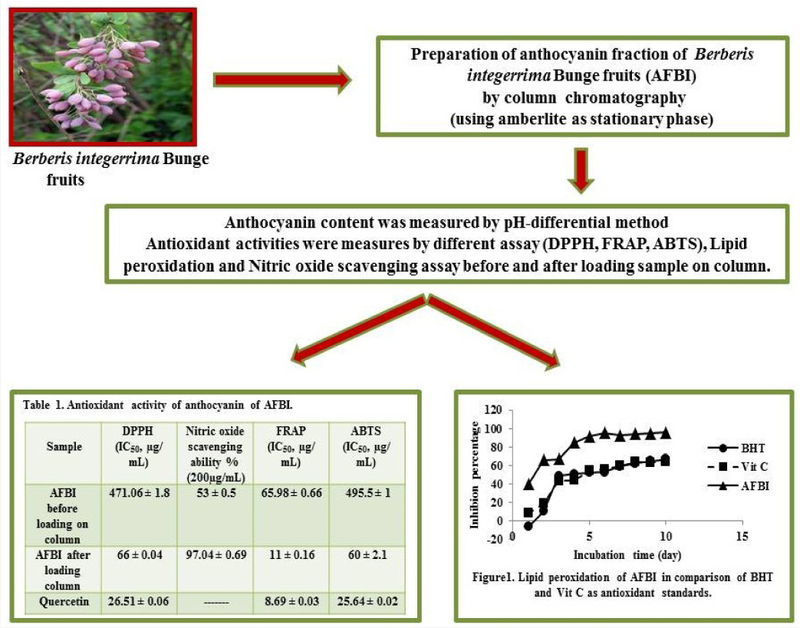 The aim of this study was to separation of anthoyanin fraction of Berberis integerrima Bunge fruits (AFBI), evaluation of anthocyanin content in this fraction and antioxidant activity assessment of this fraction by different methods: DPPH, ABTS radial scavenging assay, inhibition of lipid peroxidation and nitric oxide. All the chemicals used were obtained from Sigma and Aldrich Company (St. Louis, MO, USA). Berberis integerrima Bunge fruits were manually harvested during August and September 2104, from Kohmar (Fars Province, Iran), and were identified by Ms. S. Khademian in the museum of medicinal plants, Shiraz University of Medical Sciences, Shiraz, Iran (voucher no. P. M. 396). 325 g of freeze-dried fruits powder was percolated with ethanol for 48h and the extract concentrated in rotary evaporator under vacuum followed by speed vacuum to get 140 g gummy material. 30 g of the crude extract was then suspended in 0.3% TFA then filtered and shake well with ethyl acetate in decanter. The aqueous phase was collected, this extraction repeated three times. This phase was loaded an amberlite column (2.5×45 cm), then rinsed with distilled water containing 0.3% TFA to remove polysaccharides .The anthocyanin were eluted with 0.3% TFA in methanol then concentrated by rotary evaporator. Yield of extraction and anthocyanin fractionation were 20% and 2.57%, respectively. where A is ((A519 (pH1.0)-A519 (pH4.5)), MW is the molecular weight of anthocyanin (433.2 g/mol), DF is the dilution factor (10), ε is the extinction coefficient (31600 L cm-1mol-1) and L is the path length (1 cm). 100 - [(A) sample-(A) blank)×100 / (A) control]. Control: contains DPPH without sample; blank: methanol. Nitric oxide (NO) radical scavenging method was performed with slight modification.9 Sodium nitroprusside in phosphate buffer (0.2 M, pH 7.4) was mixed with each sample and incubated (27 °C for 150 min). After incubation, 100 μL of o Griess reagent was added to each sample and then incubated 5 min at room temperature. Finally, absorbance was measured at 542 nm. In the presence of antioxidants, ferric and tripyridyltriazine (TPTZ) reduce and change its color complex. The FRAP reagent included TPTZ solution (10 mM) in HCl (40 mM), FeCl3 (20 mM) and acetate buffer (0.3 M , pH 3.6). The fresh mixture was prepared and incubated at 37 °C. The thiobarbituric acid (TBA) assay was carried out by the method of Rael et al. with slight modifications 9. Initially mixture prepared in a screw-cap vial contain 4.0 mg of a sample in 4 mL of 99.5% ethanol, 4.1 mL of 2.5% linoleic acid in 99.5% ethanol, 8.0 mL of 0.02 M phosphate buffer (pH 7.0) and 3.9 mL of water then this mixture was placed at 40 °C in the dark. To 0.1 mL of this mixture, 9.7 mL of 75% (v/v) ethanol and 0.1 mL of 30% ammonium thiocyanate was added. Then 0.1 mL of 0.02 M ferrous chloride in 3.5% hydrochloric acid was added to the reaction mixture, the absorbance was measured at 500 nm. The absorbance was measured at this wavelength every 24 h until the day after that the absorbance of the control reached its maximum value. where Ao is absorbance of control and A1 is absorbance of sample is absorbance of sample. All experiments were performed three times and results are reported as the mean ± standard deviation. In this study, anthocyanin of AFBI measurement by the pH-differential method showed that anthocyanin content of fruits before use of amberlite column as a stationary phase is 14.36 ± 0.33 mg/g and anthocyanin content is 34.51 ± 0.42 mg/g after separation of fraction by column. Results of lipid proxidation assay of AFBI and standards. Antioxidant activity of sample before and after loading on column by different methods. In DPPH assay radical react with hydrogen donor antioxidant and DPPH color convert from purple to yellow. Antioxidant activity related to change of color and measure by reduction of DPPH maximum absorption.18-19 The IC50 of this assay reduce to 66 ± 0.04 μg/mL after loading on column while IC50 of Quercetin is 26.51 ± 0.06 μg/mL (Table 1). FRAP assay engaged to assessment radical scavenging of AFBI. Reaction of TPTZ-Fe (III) complex by antioxidant leads to form TPTZ-Fe (II) complex. The absorbance of this complex at 593 nm shows the reducing power of samples.14 The reduction of IC50 value after loading on column show reducing power of sample increased by using this type of column. As shown in figure 1. The percentages of inhibition are about 39% in first day and 95% after 10 days. The inhibition percentage of lipid peroxidation was observed 66.863% for BHT and 64.06% for Vit C in the tenth day. According to these, it seems that AFBI is more effective than BHT and Vit C to protect lipid from peroxidation. 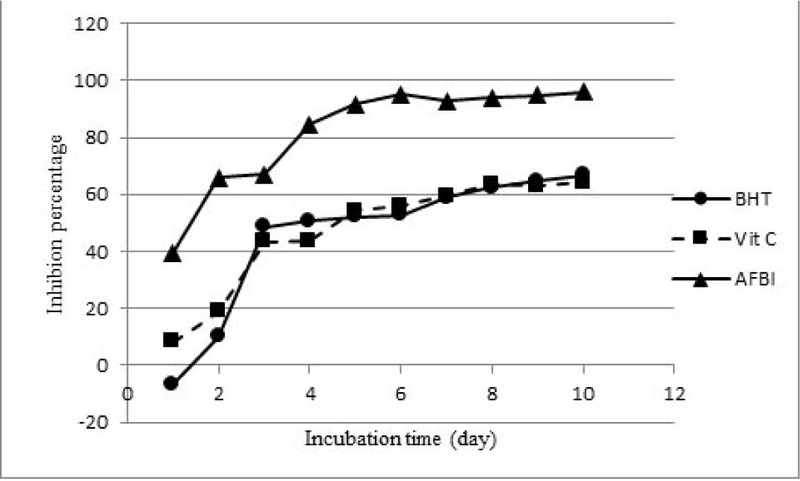 Lipid peroxidation assay exhibited the strong protective effect of AFBI on lipid peroxidation after ten days and there is significant difference with BHT and Vit C and AFBI. Lipid peroxidation is results of free-radicals attack and oxidation of polyunsaturated fatty acids (PUFAs) which participate in membrane composition.20-29 It is assumed that lipid oxidative damages related to change genes involved in developmental processes such as differentiation and aging and different disease.30 So the ability of AFBI to prevent lipid peroxidation is promising to modify age related complications. Our research shows the high antioxidant activity of Berberis integerrima Bunge fruits. The high level of anthocyanins content suggested that these fruits considered as appropriate source of functional antioxidant and improve human health. Further studies help to reveal more biological effects. Berberis integerrima belongs to Berberidaceae comprise various secondary metabolites which candidate it as therapeutic herb in different disease. This study provides isolation of anthocyanin fraction of Berberis integerrima Bunge fruit by column chromatography. Anthocyanin content was measured by PH-differential method and antioxidant activities of this fraction quantified by various methods (DPPH, FRAP, ABTS) before and after loading on column as well as lipid peroxidation assay. Determination of antioxidant activities using different methods is worthwhile to realize the mechanism of antioxidant activities. This study was financially supported by Shiraz University of Medical Sciences Grant number (94-01-70-9579). 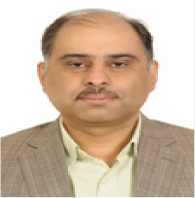 Dr. Mahmoodreza Moein is Pharm.D., Ph.D. in Pharmacognosy. 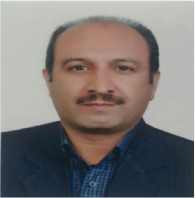 He is head of Department of Pharmacognosy, School of Pharmacy, Shiraz University of Medical Sciences, Shiraz, Iran. 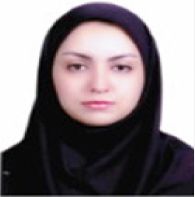 Dr. Zahra Sabahi is Pharm.D., Ph.D. in Pharmaceutical Biotechnology. 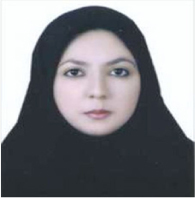 She is Assistant Professor in Medicinal Plants Processing Research Center, Shiraz University of Medical Sciences, Shiraz, Iran. Dr. Mohammad Javad Khoshnood is Pharm.D., Ph.D. in Toxicology. He is Associate Professor in Department of Toxicology and Pharmacology, School of Pharmacy, Shiraz University of Medical Sciences, Shiraz, Iran. Fatemeh Farmani is M.S. in Agricultural Biotechnology. She is research assistant in Medicinal Plants Processing Research Center, Shiraz University of Medical Sciences, Shiraz, Iran. Conflicts of interest CONFLICT OF INTEREST The authors declared no potential conflicts of interest.